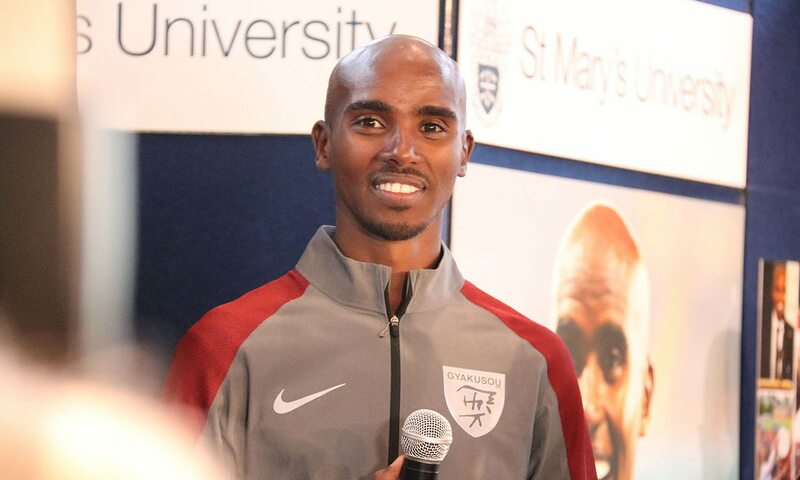 Sir Mo Farah attended the renaming of the St Mary’s University track in his honour on Thursday. The all-weather track, which the Queen opened in 2012, will now be named after the multi Olympic and world champion. Farah trained at St Mary’s from 2001 to 2011, where he was awarded a scholarship to the Endurance Performance and Coaching Centre (EPACC) and continued to train regularly at the facility until he moved to Oregon, USA. At the time Farah was one of two athletes to be granted an athletics scholarship. Such is the success of the scheme, it now numbers over 120. Farah returned on Thursday to meet with young athletes from the local community. He was also able to meet with the current generation of athletes from the Endurance Performance and Coaching Centre. He said: “It is such an honour to be here today and to have this track named after me – thank you so much, St Mary’s! “I have very fond memories of my time here as I developed from being a talented junior to a world-class athlete. Others there included world record-holders Steve Cram and David Bedford. Bedford was behind the original London Marathon link with the University that funded the initiative. Farah admitted he wasn’t as dedicated as he should have been when he first came to the University. “I had thought about joining the Army,” he said. “At first St Mary’s was fun and you get up to all sorts when you are 17 or 18. I apologise to the staff then for the trouble I caused! Farah added that he is really looking forward to the London 2017 IAAF World Championships and admitted his loss in Edinburgh earlier this year gave him extra incentive. He runs the 5000m at the Müller Indoor Grand Prix in Birmingham on Saturday. “I love the sport and love what I do and I’m really excited about London and it being my last track races,” said Farah. “It would be nice to finish on a high. Current athletes who attended the track renaming included Charlie Grice, Adelle Tracey and Richard Goodman.